For people of color, U.S. banks are shutting the door to homeownership. And for nearly a year, the Southeastern Pennsylvania Transportation Authority has been fighting to keep this story off the streets of Philadelphia. Last year, we reported that African Americans in Philadelphia were far more likely to be denied a home loan than their white counterparts, even when they made the same amount of money, tried to get the same size loan and wanted to buy in the same neighborhood. We combed through 31 million mortgage records, covering nearly every loan application in America in 2015 and 2016. Even taking various factors – such as applicants’ income, loan amount and the neighborhood where they wanted to live – into consideration, our analysis found some disturbing patterns. In dozens of cities across the country, banks and other mortgage lenders were far more likely to turn down loan applications from people of color than whites, even when they had a similar economic profile. Philadelphia was one of the largest cities with the problem. Although white and black residents make up a similar share of the population here, white applicants received 10 times as many conventional home purchase loans as African Americans. Meanwhile, the transit agency allows banks to advertise to its riders that the financial institutions do not discriminate. SEPTA is not only ignoring First Amendment principles, but also is engaging in unconstitutional censorship. Our story is based on solid facts and an unbiased analysis – not advocacy. These facts are tied to a deep history of racial bias in this country. More than 50 years ago, Congress banned racial discrimination in lending after the assassination of Martin Luther King Jr. But we found the homeownership gap between black and white Americans has grown wider than it was during the Jim Crow era. Back then, segregation was legal and discrimination was encouraged by the government in a process called “redlining.” Now, it’s against the law, but the problem persists. We released our investigation last February. The story aired nationwide on our public radio show, Reveal and PBS NewsHour and was published via the Associated Press in hundreds of newspapers, including The Philadelphia Inquirer. Political leaders took note. In Washington, members of the House Financial Services Committee quizzed the chairman of the Federal Reserve about our findings, which have been entered into the congressional record. Six attorneys general, including Pennsylvania’s Josh Shapiro, have launched investigations. The Philadelphia City Council has held hearings and is exploring potential solutions. The information that has stirred this vital public debate is the same information that SEPTA thinks its riders cannot handle because it is too incendiary. 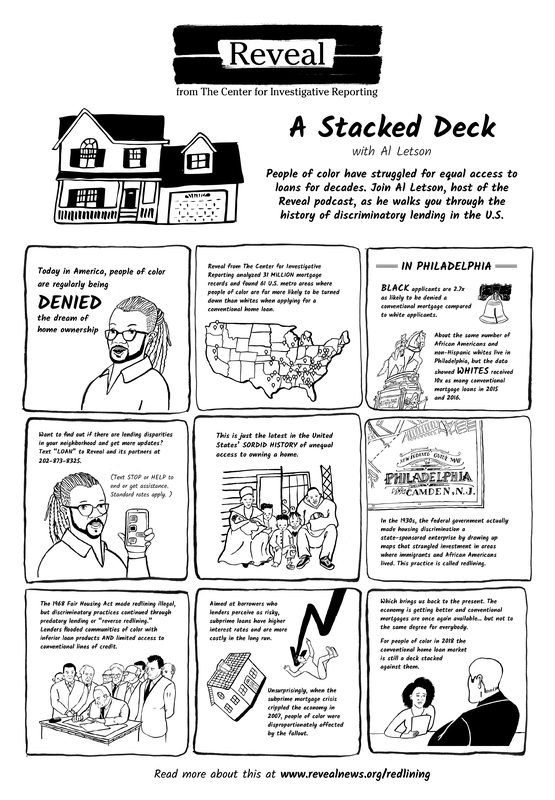 Like the radio, television and print versions of our reporting, the 10-panel comic strip tells the story of modern-day redlining. It also gives Philadelphians a tool: By texting the word “LOAN” to 202-873-8325 (standard rates apply), they can see how banks are making loans in their neighborhoods. Needless to say, we think protecting our First Amendment rights is vital and we are appealing the decision. How can we, as a society, deal with the problem if we’re afraid to confront the facts? We will never fix the impacts of racism if we are prevented from having a conversation about how it manifests in our communities today.